If you want to make ice cream, you've got several options as far as the cooling method - a machine that uses salt and ice, one that uses a bowl that needs to be chilled in the freezer before churning, or a machine that has its own compressor. Note: If you aren't a serious ice-cream-making fiend, you might want to stop reading right now. This machine is intended for the serious ice-creamista who works hard at perfecting recipes and makes a LOT of ice cream. The Breville Smart Scoop Ice Cream Machine ($399) is the third type. The upside is that you can make ice cream any time you want to, and you can make one batch after another. The downside is that the machine is quite large (footprint is about 11x16) and it's heavy. This the the type of appliance that you'll want to park somewhere and not move very often. 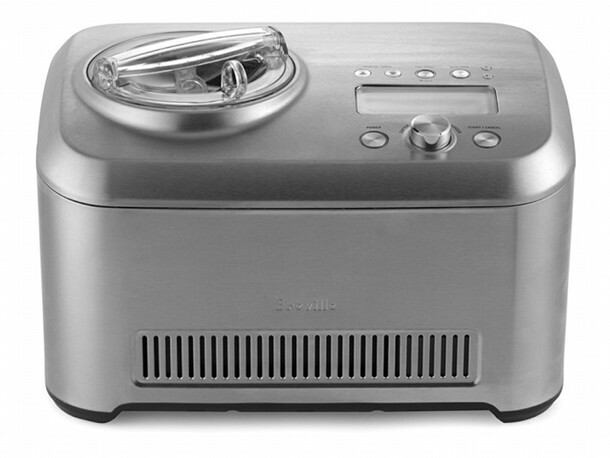 Unlike other types of ice cream makers, this one stays cold - or gets colder - as the ice cream chills and churns. With a freezer bowl, eventually the bowl thaws and you've got no more chilling power. Keep churning, and the ice cream starts melting. With this one, you can churn a lot longer if you need to, and end up with a firmer product. It also means that you can pour in a mixture that's not quite fully chilled, since you don't need to worry about the bowl thawing before the ice cream is fully churned. 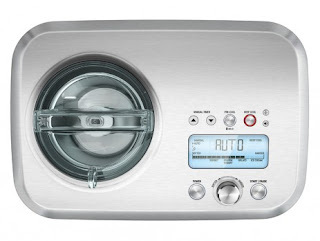 This also has a keep-chilled feature, so you can make the ice cream and leave it in the machine for up to three hours. It occasionally churns to keep the whole mixture at the right temperature. I'm not exactly sure why you'd need that feature, but it's there. The most innovative feature on this machine is that you can choose several different levels of hardness for your frozen dessert, so you can opt to have it stop churning and chilling sooner if you want a softer product. Or keep churning and chilling longer, if you prefer. The machine senses the harness of the mixture as it churns, and stops at the appropriate time. If you want really solid ice cream, you'll still want to chill it further in the freezer, but it does turn out a harder (but still soft-serve) ice cream than I've gotten from other methods. The lid needs to stay in place during churning (it helps hold the shaft of the paddle in place) but you can open a door on the lid for mix-ins that you prefer to add towards the end of the churning time. A pre-cool function cools the machine prior to churning (or you can just start churning while it's chilling), and pretty lights and indicators show the progress, temperature, and elapsed chilling time. A chime rings when it's time for add-ins, and you can choose from several musical options to signal when the ice cream is done. It's all very space-agey and sleek and modern. Figure an hour or less to churn a batch of ice cream without pre-chilling, depending on things like the starting temperature of your ingredients and how hard you want the final product to be. I have to say that this machine makes great ice cream, about a quart - or slightly more - at a time, and it's pretty simple to operate. Because this can churn ice cream longer, I've gotten some excellent ice creams that wouldn't have worked as well with my frozen-bowl model. But whether it's worth the space and cost really depends on your level of ice cream dependency. It really isn't for the casual user. Note: This was going to be a MUCH different post. I struggled for a long time trying to get a decent batch of ice cream and couldn't believe how difficult it was. Different recipes, different settings, different temperatures. The machine stalled every time, well before the ice cream was fully churned. It didn't make sense. 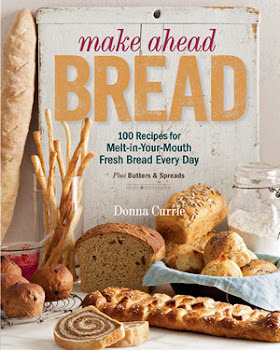 Even the recipe from their own book didn't work. How finicky could this thing be? I looked at other reviews on other sites to see if this was a flaw noted by other users. But no, this was never mentioned. So either there was a problem with this machine in particular, or I was doing something horribly wrong. 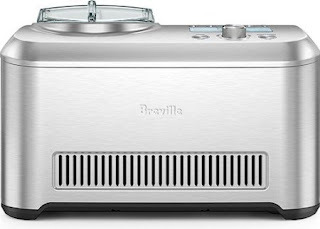 I called the support line (and I have to say the customer service folks at Breville are very nice) and they determined that there was a problem with the unit. They didn't know exactly what was wrong, but they were pretty sure there was a problem. Shortly, I had a different one, and I immediately noticed that the way the bowl and cover fit the unit was different. I doubt the previous unit had a manufacturing flaw, or the person who reviewed it previously would have reported it. So ... how did those plastic parts get so horribly warped - melted, almost? What happened to the washer that was supposed to be screwed onto the bottom of the bowl? Your guess is as good as mine. This time, the machine churned every mixture I threw into it, including some rather dicey mixtures that would never have worked in my freezer-bowl ice cream maker. I'm glad I took the time to return the unit before I wrote the review. This really is an excellent machine. Pricey, but very, very nice. A sample was provided for the purpose of a review on Serious Eats.